The Russian President has one last chance to reform a creaky economy and a sulking society. Vladimir Putin is facing an unfamiliar problem. After 13 years at the helm, he no longer has the job of saving the largest country on the planet. That file is closed. Because of Putin’s astute diplomacy and America’s Middle East misadventures, Western attempts to put Russia in a box have fizzled out. Emergent Russia is, therefore, no longer threatened by a terminally declining West. On May 7 when Putin walks into his Kremlin office to serve a third term as President, the pomp and pageantry of the ceremonies will not conceal the fact that the Russian leader is treading on tricky terrain. That’s because now he has to perform the distinctly mundane – and complex – task of making Russia tick. Putin will find that photos of him fishing bare-chested or tranquilising Siberian tigers won’t fetch any mileage with Russian voters. US President Barack Obama has discovered it in the last few months of his first term, and soon the Russian leader will also stumble upon the inescapable reality of democracy – the honeymoon never lasts. Putin was the outsider, the KGB knight who came in from the cold to set right a broken system. Two terms later, he is the system – the establishment that the public loves to hate when things don’t work. Indeed, as Russian leaders get accustomed to democracy they’ll realise that incumbency can be a pretty heavy burden, especially for those in a hurry. For, there’s a hell of lot of work to be done in Russia. Economists have observed that people earning $60,000 a year are twice as happy as those earning $30,000 a year. But that’s where it starts tapering off – people earning $200,000 a year are not happier than those earning $60,000 a year. That’s because once your basic needs are met, more money doesn’t matter; at least it doesn’t make things any better. What really matter are job security, crime-free cities, family life and health, and in all these yardsticks Russia is slipping. I won’t go into the dismal life expectancy for men or the crime stats, but Russia has a major problem. It is a real concern when wealthy Russians start packing up their bags and settle abroad. While Russia doesn’t show any signs of societal upheaval like in the United States or Western Europe, this exodus is not the sign of a harmonious society. Oil and gas will not go out of fashion. Despite all those jokes about the Arabs going back to riding camels, the reality is that the world’s oil and gas fields are not about to run dry. Well, not for a hundred years at least. So countries dependent on these resources do not have to panic. However, that rule is for Saudi Arabia or Qatar. For Russia, which boasts a highly educated and intellectual population with vast achievements in science and technology, it is dangerous to be so dependent on fossil fuels and minerals. Russia’s successful military and space programmes have yielded few known commercial spinoffs. More than 20 years after the Soviet Union dissolved, Russia doesn’t have a globally renowned consumer durables brand. (At the same time, South Korean multinationals have walked away with some of the crown jewels of Russia’s skunkworks.) This is a reflection of the paucity of small and medium enterprises which incidentally are most vulnerable to mafia shakedowns. During the economic chaos of the 1990s, tens of thousands of scientists, engineers and intellectuals abandoned Russia. Though the pace of the brain drain has slowed, the country's research base has been severely depleted. Moscow’s top initiative to reverse this trend is Skolkovo – a multi-billion dollar project near Moscow that aims to rival Silicon Valley. While Silicon Valley it isn’t, Skolkovo claims to have attracted more than 300 companies as of December 2011. Sure, some of the world’s leading companies are there, but it remains to be seen if the brain drain finally ends. Incidentally, Skolkovo lies outside the Moscow Ring Road and for many of Russia’s elite that’s where Russia ends. An email I sent to the project’s information department three weeks ago remains unanswered. But hopefully my pessimism on Skolkovo will be dispelled. The West likes to depict Putin as the villain in Russia’s democratic soap opera. But they are missing the point – it is Western backing and moral support that is the kiss of death for the Russian opposition. And yet European and US ‘observers’ and think tanks pour into Russia with letters of commendation for the opposition and brickbats for Putin. This only weakens the opposition because the majority of Russian voters recognise the insincerity of their shrill rhetoric. Western-style democracy is one of the most overrated governing systems ever developed. The enduring prosperity of the Asian Tigers in contrast to the recent failures of the democratic West makes me wonder: why do Western spin doctors prescribe the democracy pill for everyone when it has failed – nearly as spectacularly as communism? In this backdrop, Putin’s authoritarian prosperity isn’t such a bad idea, after all. But that’s up to the Russian people to decide, and traditionally Russians have opted for strong central rule. (Painful memories of a drunk who ruined the nineties remain.) Whether Russia opts for the strongman proposition or goes for chaotic coalitions in the future, only time will tell. Hint: billionaire businessman Mikhail Prokhorov, who got 7.9 percent of the votes, had a private meeting with Putin after the March 2012 election. Kremlin watchers feel a new era of political give and take is on the cards in Russia’s political landscape. In fact, the election has changed Putin’s equation with the Russian public. With his United Russia Party not having total dominance and opponents like Prokhorov having tasted blood, Putin won’t have the luxury of rule by fiat. Consensus is likely to be the new policy for those at the highest echelons of power in the Kremlin. In the meantime, Putin must also groom the next generation of Russian leaders to create a political and economic elite that will ensure the success of his regime. “As a former member of the KGB, Putin’s world view is fossilised.” I admit I nearly fell off my chair when I read this piece of analysis in a leading American publication. Anyone with even a smattering of knowledge about the KGB will agree that the former spy agency, despite all its faults, was one of the most adaptable outfits in Russia. If anything, a former KGB officer is most likely to be a owning a business or some enterprise – even criminal – in the new Russia. That’s because KGB officers were an elite breed who could multitask and were multilingual, giving them the edge in a capitalist society. Plus, the KGB had a world view which the average communist party leader lacked. The KGB is the reason why Putin – who speaks fluent German – is the antithesis of a typical Russian politician. It is also why a former German Chancellor, Gerhard Schroeder, works for him at Nord Stream. It’s amazing how hatred – which comes from fear for the KGB – can blind so many otherwise well-read experts. Also, the Western media often refers to Putin as “the former KGB spy”. He was more than that – a former KGB general, Putin was the agency’s station chief in Berlin. Incidentally, former US president George Bush (Sr) was the CIA’s chief. But you don’t hear the US media refer to him as “the former CIA spy”. Russia is not an expansionist empire any more. While it may not be the behemoth it once was as part of the Soviet Union, Russia still wields considerable military clout and also craves respect. More importantly it is hypersensitive to any meddling in its delicate underbelly, the Caucasus, and Moscow’s near abroad, Eastern Europe. If Russian generals threaten to turn Poland into a parking lot, for hosting America’s ABM systems, it is because Russia’s security is compromised in the same way that America’s would be if Cuba allowed Russian missiles to be stationed on its territory. That's why in 2008 Russia took out Georgia and humiliated its nutcase leader, Mikheil Saakashvili, and will surely send its troops where needed to restore Moscow’s influence. And you can take that to the bank. In fact, in such matters one cannot expect Putin to be any different in his dealings. However, he will have to compromise on Iran and Syria for two reasons. One, stonewalling matters at the United Nations by using Russia’s veto power will not only lower the UN’s influence and prestige but also Russia’s. The Security Council permanent seat is one of the few visible symbols of Russian power and Putin should be careful not to dilute that. Secondly, in Iran’s case a NATO-led war will increase anti-Americanism to a new high, especially in the Middle East. Plus, if the price of oil zooms to the stratosphere, the Russian exchequer won’t be complaining. But if war doesn’t come, Iran will continue to be a major buyer of Russian weapons and capital goods. For Putin it seems like a win-win situation. Nabucco was the magic word that the Americans believed would orchestrate Russia’s defeat in the great pipeline game in Eurasia. It was meant to be a gigantic pump that would draw vast quantities of gas from fields in Central Asia and move it to Europe. Putin had other ideas. Today, Nabucco has hit the nadir whereas Russia’s Nord Stream (a direct pipeline to Germany, bypassing Ukraine and the Balts) is nearing completion. Also likely to be a success is South Stream which Putin is promoting aggressively. Putin has outmanoeuvered the Americans and Europeans on several occasions, ensuring that their pet projects in Central Asia and East Europe have come crashing down. What he needs to do now is build a pipeline to India, which is poised to be the world’s second largest energy consumer. If he can guarantee the safety of the pipeline, it would be a bulletproof partnership. Shortly after the fall of Constantinople in 1453, a Russian Orthodox monk nominated Russia as the Third Rome, or successor to the Roman and Byzantine empires. Fired by that messianic spirit, the tsars expanded the empire in all directions but Russians remained trapped in serfdom. The Bolshevik revolution of the 20th century led to rapid industrialisation but basically it was one set of tyrants replacing another. 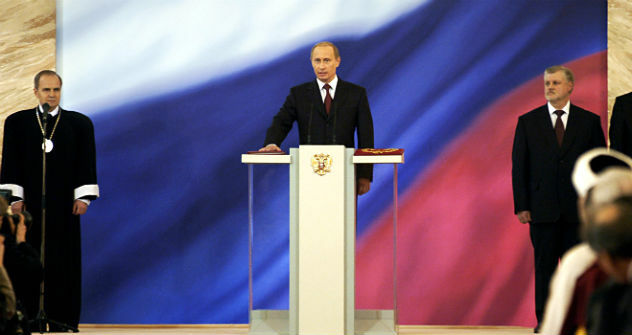 In the post-Soviet century, Putin has raised a great nation from its knees back on its feet. But before he entertains visions of Muscovite Third Romism, Putin first has to pull the creaky Russian juggernaut on the road to reform and rule of law. He has just one shot at it. The honeymoon, remember, is over.